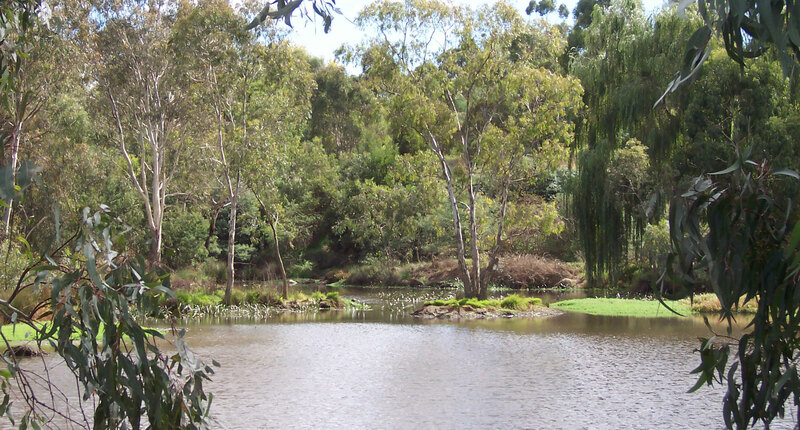 The Alphington Wetlands is located on the flood plain of the Yarra River at the southern end of Alphington Park and on the adjacent privately owned land at 1 View Street (Melways Ref 31C12). Before European settlement, this area was the home of the traditional owners, the Wurundjeri-willam people. The floodplain adjacent to the Yarra River was extensively cleared for farming and little of the original bush remains. It has been recently replanted with many of the trees, shrubs and grasses which are indigenous to the area and a wetlands system created, which is fed by natural rainfall and the stormwater from the nearby streets and houses. The Alphington Wetlands is a collaborative project involving the South Alphington and Fairfield Civic Association (SAFCA) Inc, City of Yarra, Kate Herd of 1 View Street, and local residents. It was established in 1998 and has been developed with funding assistance from Parks Victoria, Melbourne Water, Greening Australia (Victoria), Australia's Open Garden Scheme and the City of Yarra. The site also contains the remains of the Alphington Swimming Pool, which was built by local residents in the 1920s and was a focus of community life until the 1960s.